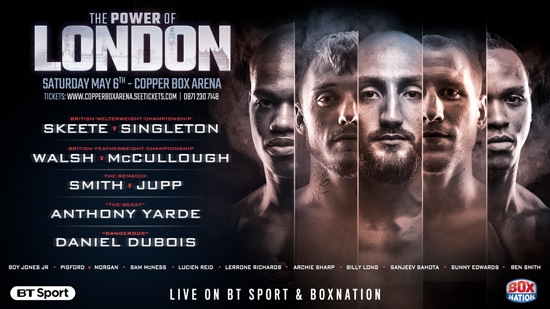 Welterweight supremo Bradley Skeete tops an unmissable evening of action when he makes the second defence of his prestigious Lord Lonsdale Belt against Shayne Singleton at the Copper Box Arena on Saturday 6th May, live on BT Sport and BoxNation. British, Commonwealth and WBO European Champion Skeete has climbed to the very top of the domestic Welterweight scene and is determined to win the Lonsdale strap outright before setting his sights on World honours later in the year. “Psychologically I’m right ‘on it’ with my British title at stake,” said Skeete. “I desperately want the Lonsdale Belt outright so the title defences mean everything. I know every challenger will desperately try to take what’s mine so I’ll be training really hard. “Shayne’s got a good record and some good wins like Curtis Woodhouse and Adil Anwar. He’s got fast hands, good movement and, given the notice he’s had, we expect he’ll bring his A game. Since debuting in August 2009, Karl Ince coached Singleton has picked up the English Super-Lightweight and WBC International Silver Welterweight titles and plans on adding Skeete’s British belt to his collection on May 6th. “They don’t give British and Commonwealth titles away,” said Singleton. “Bradley is quality. The lad’s got everything; fantastic range and he rarely gets hit. But I also see a way of beating him and that’s why I took the fight. Others are expecting a cautious, cagey affair but they’ll be in for a shock. Expect the unexpected! “I believe my speed, accuracy and movement will trouble him, big time. I’ll make him answer questions and just believe I’ll be too much for him on the night. Just like Adil Anwar, Skeete’s very awkward and bounces around….but the outcome is gonna be exactly the same. Chief support on the card sees Cromer hero Ryan Walsh defend his British Featherweight belt against Belfast’s Marco McCullough. All action Walsh etched his name into the boxing records books when he won the title in September 2015 to join twin brother Liam as the first ever set of twins to hold the prized Lonsdale belt simultaneously and is aiming to get back to winning ways after losing to Dennis Ceylan in Denmark last time out. WBO Inter-Continental Featherweight Champion McCullough ended 2016 in sensational style with a highly-entertaining stoppage victory over Luis Lugo at the Titanic Exhibition Centre and the former WBO European Featherweight Champion will head into the fight brimming with confidence. Elsewhere on the card, Harrow Lightweight Mitchell Smith has a chance of gaining revenge when he rematches with Belvedere rival George Jupp; Light-Heavyweight sensation Anthony Yarde aims for another explosive knockout win; Heavyweight amateur star Daniel Dubois fights in the capital for the first time as a professional; Chingford Super-Featherweight Boy Jones Jnr looks to improve his unbeaten record; Southampton knockout king Joe Pigford takes on unbeaten Barking Super-Welterweight Aaron Morgan; Hammers fanatic Sam McNess goes for his seventh pro win; Ilford Super-Bantamwieght Lucien Reid; New Malden Super-Middleweight Lerrone Richards; Welling Super-Featherweight Archie sharp; Chelmsford Super-Middleweight Billy Long; Hornchurch Super-Lightweight Sanjeev Sahota; Croydon’s Sunny Edwards and Wycombe Super-Lightweight Ben Smithcomplete a talent-packed card. Tickets for May 6 priced £40, £50, £70, £100, £150, and VIP £200 are available from www.copperboxarena.seetickets.com and 0871 2307148.